An effective way of clarifying and promoting worthy causes is to use metaphors. Everybody understands the concept of making war, which is typically associated with physical violence in fighting an enemy. But the war metaphor has also been used in promoting non-violent causes. Three popular examples in modern times are the “War on Poverty”, “The War on Drugs”, and, most recently, “The War on Terrorism”. And now, Bill McKibben, founder of 350.org, a leading climate change organization, proposes another war, this time a “War on Climate Change”. His passionate and very informative article—“We Need to Literally Declare War on Climate Change” (first article in Views)—provides a substantive argument for urgently mobilizing all international forces to combat the growing challenges associated with climate change and its disastrous potential for long-term harm to our planet—and us. I hope you will read the full article; or at least read the full summary, which is longer than normally provided. Along with a war on climate change, how about declaring a “War on Ignorance”? There’s sufficient evidence that, nationally and worldwide, many educational systems are failing to provide a well-rounded educational experience, with rote learning overcoming critical, creative thinking. Moreover, in much of the world education is based largely on indoctrination, providing a platform for promoting nationalistic propaganda, socio-cultural norms, and religious beliefs. Throughout the U.S. we continue experiencing a dumbing-down phenomenon, an anti-intellectual bias represented by a large group of citizens who think irrationally and behave uncivilly. Some have called this phenomenon “The Trump Effect”. Another war, one that has once again surfaced, is “The War on Social Injustice. This movement is primarily associated with the current “Black Lives Matter” and “LGBT” movements, as well as the earlier ‘Occupy” movement. The most recent social justice movement began with Bernie Sanders and his followers, and the developing result will be a new organization called “Our Revolution”. I’m not sure where the “Tea Party” movement fits in, but it might also be considered a social justice movement, one that represents a large number of conservative citizens. With these active movements in place, it seems that social justice is probably the main war being fought at this time, most likely because It affects lots of people, and seeks more immediate, short-term solutions. Obviously, it’s easier for most people to seek solutions for injustices they experience daily than to be concerned with causes like climate change or educational reforms, which appear to be long-term concerns. But aren’t they all connected? Wouldn’t all aspects of life improve—for people worldwide—if all nations were urgently galvanized into taking aggressive cooperative and collaborative action to save the planet and civilization for future generations—a war for all wars? We need a common goal for humanity, and if climate change isn’t the major life-or-death defining crisis, I don’t know what is. NOTE: There will be no issue of this e-newsletter for the next five weeks. Issue #146 should appear in your mailbox on September 28th. We’re heading for a western adventure that will include revisiting some national parks, from North Dakota, Montana, and Wyoming to Utah, New Mexico, and Colorado. We’re looking forward to hiking some favorite trails, as well as enjoying some new sights and trails. And our timing coincides with the National Park Service celebrating its 100th year anniversary. Off we go! 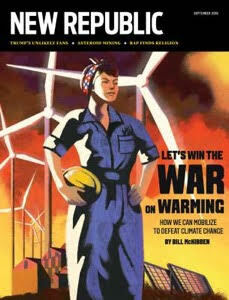 > New Republic: We Need To Literally Declare War On Climate Change (Bill McKibben). By most of the ways we measure wars, climate change is the real deal: Carbon and methane are seizing physical territory, sowing havoc and panic, racking up casualties, and even destabilizing governments. (Over the past few years, record-setting droughts have helped undermine the brutal strongman of Syria and fuel the rise of Boko Haram in Nigeria.) It’s not that global warming is like a world war. It is a world war. Its first victims, ironically, are those who have done the least to cause the crisis. But it’s a world war aimed at us all. And if we lose, we will be as decimated and helpless as the losers in every conflict–except that this time, there will be no winners, and no end to the planet-wide occupation that follows. The question is not, are we in a world war? The question is, will we fight back? And if we do, can we actually defeat an enemy as powerful and inexorable as the laws of physics? Today we live in the privatized, business-dominated world that took root under McNamara and flourished under Reagan. The actual wars we fight are marked by profiteering, and employ as many private contractors as they do soldiers. Our spirit of social solidarity is, to put it mildly, thin. There are powerful forces, of course, that stand in the way of a full-scale mobilization. Like fascism, climate change is one of those rare crises that gets stronger if you don’t attack. In every war, there are very real tipping points, past which victory, or even a draw, will become impossible. “It would be a grave mistake for the United States to wait for another nation to take the lead in combating the global climate emergency,” the Democratic platform asserts. “We are committed to a national mobilization, and to leading a global effort to mobilize nations to address this threat on a scale not seen since World War II.” We’ve waited so long to fight back in this war that total victory is impossible, and total defeat can’t be ruled out. > NPR: Should We Be Having Kids In The Age Of Climate Change? (Jennifer Ludden). Because of climate change projections, Travis Rieder, a philosopher-ethicist, proposes a “small-family ethic”—to question the assumptions of a society that sees having children as good.” Scientists warn that a catastrophic tipping point is possible in the next few decades. By midcentury, possibly before, the average global temperature is projected to rise by more than 2 degrees Celsius, the point scientists and world leaders agree would trigger cataclysmic consequences. Rieder cites a study from 2010 that looked at the impact of demographic change on global carbon emissions. It found that slowing population growth could eliminate one-fifth to one-quarter of all the carbon emissions that need to be cut by midcentury to avoid that potentially catastrophic tipping point. Rieder and his Georgetown collaborators have a proposal that aims to persuade people to choose fewer children with a strategy that boils down to carrots for the poor, sticks for the rich. > NPG: Climate Change And The U.S. Infrastructure (Don Mann). The latest American Society of Civil Engineers (ASCE) 2013 Report Card for America’s Infrastructure gave the U.S. an overall grade of D+, with the energy sector also receiving a D+ ranking, stating that “Investment in power transmission has increased since 2005, but ongoing permitting issues, weather events, and limited maintenance have contributed to an increasing number of failures and power interruptions.” ASCE estimates an investment of $3.6 trillion by 2020 is needed just to repair and maintain our nation’s infrastructure, which includes: aviation, bridges, dams, drinking water, energy, hazardous waste, inland waterways, levees, ports, public parks and recreation, rail, roads, schools, solid waste, transit, and wastewater. Also stated was a grave concern that the current state of our infrastructure (including energy resources) will continue to deteriorate unless we halt, and eventually reverse, the growth of our population. > Resource Insights: Resource Insights: Limitless Imagination And Physical Limits (Kurt Cobb). Technology has given us the illusion of increasing “efficiency” in labor, when in fact this “efficiency” has been achieved through the wildly inefficient use of energy from the burning of fossil fuels, the reason we are burning through so much fossil fuel so fast and creating climate change and depletion problems. I would like to propose a check on every “miracle” technology we are expecting in the future. If the proponent of any yet-to-be-invented or yet-to-be-widely-deployed technology cannot explain where he or she will get all the energy needed to run it at scale in ways that 1) won’t destroy the climate and 2) are in accordance with the known laws of physics, be very skeptical that it will ever be widely used. So far, the best information we have about how to avoid a climate catastrophe is summed up in two principles: 1) Stop emitting greenhouse gases and 2) stop destroying things such as forests, which absorb them. > PeakOil: Is The Oil Industry Dying? (Richard Heinberg). Petroleum markets are so glutted and prices are so low that most industry commenters think any worry about future oil supplies is pointless. The glut and price dip, however, are hardly indications of a healthy industry; instead, they are symptoms of an increasing inability to match production cost, supply, and demand in a way that’s profitable for producers but affordable for society. Is this what peak oil looks like? Aside from issuing forecasts regarding the timing of the inevitable moment when petroleum production would max out (yes, many of those forecasts proved premature), we peak-oil writers more importantly tended to agree on three key insights, all of them as valid now as ever: 1) oil is essential to the modern world; 2) oil is hard to substitute (Depletion of oil; and of other non-renewable resources); and 3) oil tends to follow the low-hanging fruit principle. the entire petroleum business is currently in deep trouble. > Resilience: The Four Levels: New Story Activism & Burnout (Marie Goodwin). People seek to “change the world” through activism on four different levels, no matter what the activism’s focus: 1) the personal; 2) the family; 3) the community; and 4) the world-tribe. The level focused on at the moment changes throughout life; it ebbs and flows in phases, and brings richness and bounty to all of the other work we are doing in the world. But if a person works on all levels at the same time, it can create burnout and stress. We know that the personal and small acts have power; we know equally that a world tribe, a new cultural story is growing and we want to be part of that as well. Part of the “New Story activism” is re-localizing (in all its many facets) and the commons, so this work too is important. If you are working at all four levels, you are on the fast track to burnout. The levels gain importance in stages of life, and beckon us differently depending on where we are. > Star Tribune: Metazoa’s Arc: Our Personal Stake In Human Destiny (Peter M. Leschak). There are three basic outlooks. One is the Open Society Triumphant (OST), represented by Ayn Rand and touting the basic notion that humanity is the de facto master of the biosphere, that we will continue to alter it and ourselves, and that these transformations are ultimately positive, speaking to our “open” future. A second outlook, represented by Wendell Berry and Aldo Leopold, is Gaia’s Important Footnote (GIF)—Gaia being a personification of the biosphere—and holding the position that humans cannot destroy the planet, but can alter it so rapidly and radically that the conditions for our survival disappear. A third outlook is one that most people are raised with in one version or another: We are the product of a creator deity with a vested interest in our fate, and this deity has the will to intervene, that is, to change the rules. A deep faith in this outlook—regardless of particular religion—is mostly incompatible with the other two, which are science-based as opposed to belief-based. > U.S. Climate-Change News: America Is Ignoring Another Natural Disaster Near The Gulf (The Atlantic); A Small Wildfire In California Just Turned Into A Raging Inferno (Mother Jones); Louisiana Flooding Is The Country’s ‘Worst Natural Disaster’ Since Hurricane Sandy, Red Cross Says (Washington Post); Disasters Like Louisiana Floods Will Worsen As Planet Warms, Scientists Warn (The Guardian). > Think-Climate Progress: We Just Lived Through The Hottest Month In Recorded History (Joe Romm). NASA reports that last month was the hottest July on record. That follows the hottest June or record, hottest May, April, March, February, and January. How hot was it last month? As the map above shows, parts of the Arctic and Antarctic averaged as high as 7.7°C (13.9°F) above average. No wonder we’ve seen records broken for the melting of the ice sheets and Arctic sea ice. If 2016 does set the record, that would be three straight records in a row — and an ominous sign that long-awaited step-jump in global temperatures has finally come. > Thomas Reuters Foundation: U.S. Losses From Hurricanes Set To Soar By 2100 (Alex Whiting). The annual cost of damage caused by hurricanes in the United States may rise eight times by the end of the century, as the number and intensity of the storms increase on a warmer planet, researchers said on Tuesday. Globally, tropical cyclones account for more than 50 percent of economic losses caused by weather. Their impact is projected to increase “substantially” as the number of people affected grows, incomes rise and storms worsen, the researchers said. In the United States, the increase in the cost of hurricanes may even outpace economic growth if climate change is not curbed, the Germany-based Potsdam Institute for Climate Impact Research (PIK) said in a paper. Financial losses per storm could triple as a percentage of U.S. GDP by 2100 if climate change continued at its current pace. > Think-Climate Progress: Climate Change Will Make Choosing A City To Host The Olympics Almost Impossible (Natasha Geiling). As a host city, Rio de Janeiro has seen its share of problems in preparing for and hosting the 2016 Olympic Games, from collapsing infrastructure to terrible pollution. But preliminary results of an ongoing study published Friday in the journal Lancet warn that infrastructure and security issues could be dwarfed by another huge problem for potential host cities in coming years: it could become simply too hot and humid for many cities to host the games at all. In less than eighty years, the researchers concluded, only eight cities in the Northern Hemisphere — outside of Western Europe — will have a cool enough climate to host the summer games. No cities in Latin America or Africa would be viable hosts for the games, and only three North American cities — Calgary, Vancouver, and San Francisco — would qualify. Previous studies have also raised the possibility that the Winter Olympics could be equally endangered by rising global temperatures. > The Daily Star: Climate Change And The Death Of World Heritage Sites (Martin Wagner, Noni Austin). Almost one-quarter of the coral in Australia’s Great Barrier Reef World Heritage Area—one of the world’s richest and most complex ecosystems—has died this year, in the worst mass coral bleaching in recorded history. The above-average sea temperatures that triggered this bleaching were made 175 times more likely by climate change. As the ocean continues to absorb heat from the atmosphere, large-scale coral bleaching, like that which has decimated the Great Barrier Reef—not to mention other destructive phenomena spurred by rising temperatures—is likely to become even more frequent and devastating. The future of priceless World Heritage sites—and, indeed, our planet—depends on the immediate reduction of climate-change-inducing greenhouse-gas emissions. Yet many of the governments responsible for protecting these sites within their borders are not only failing to take strong climate action; they are actively pursuing dirty energy projects like coal mines and coal-fired power plants. > MinnPost: Minnesota Among 13 States With High Levels Of Risky Chemicals In Drinking Water (Ron Meador). More than 16 million Americans get their drinking water from public systems contaminated with industrial chemicals known as PFASs or PFCs, and at levels high enough to concern the U.S. Environmental Protection Agency because of the risks to public health. Although the problem is spread across 30 states (and three territories), three-fourths of the contaminated systems are in just 13—ncluding Minnesota. For more than 6 million people, the concentrations are at or above the EPA’s recommended safety maximum. PFASs have been linked to a range of medical problems from birth defects and endocrine disruption to immune-system suppression, from obesity and elevated blood cholesterol to cancer. The full paper can be read and downloaded here without charge. > Aeon: How Statistics Are Twisted To Obscure Public Understanding (Jonathan R. Goodman). In every industry, from education to healthcare to travel, the generation of quantitative data is considered important to maintain quality through competition. Yet statistics rarely show what they seem. Writing in the journal Statistical Science, the sociologist Joel Best argues that we ought to educate ourselves so that we can question how and why statistical data are generated. Statistical data do not allow for lies so much as semantic manipulation: numbers drive the misuse of words. When you are told a fact, you must question how the terms within the fact are defined, and how the data have been generated. When you read a statistic, of any kind, be sure to ask how—and more importantly, why—the statistic was generated, whom it benefits, and whether it can be trusted. > Resilience: The Solar Transition (Andrew Curry). Until recently the notion that solar energy would be the leading energy source was a possible future that was broadly regarded as impossible. There’s been an exponential fall in the cost of producing solar PV, and it is now the cheapest way to produce electricity in many parts of the world. Even in cloudier and cooler parts, such as the UK, the cost of solar is now approaching “grid parity”. I think the world’s experts missed the possibility that solar power might see dramatic falls in cost was because their mental models of technological innovation were wrong. Solar has doubled seven times in 15 years; wind has doubled four times over the same period. Battery technology is also making significant improvements as car companies turn their attention to an electric vehicle future, along with the development of other innovative storage solutions for solar-generated electricity. > Counter Currents: Grassroots Movements, Degrowth And ‘New Economies’ (Iris Kunze). There are numerous grassroots movements and initiatives worldwide with the ambition to contribute to transformative change towards more sustainable, resilient and just societies. Many of them have a specific vision on the economy and relate to alternative visions of a ‘New Economy’. The research project TRANSIT highlights four prominent strands of new economy thinking in state-of-the-art discussions: degrowth, collaborative economy, solidarity economy, and social entrepreneurship. Taking a perspective of transformative social innovation, the study draws on case studies of 12 social innovation initiatives to analyze how these relate to new economies and to transitions toward new economic arrangements. All the networks we studied—including those not focusing on finance or economics—emphasize the need for a new economy. > Transition US: Community Resilience = Emergency Preparedness (Nils Paisson). Confronted by the dawning realities of climate change, peak oil, ecological destruction, widespread systemic inequality and economic uncertainty, it has become painfully clear to a growing segment of the population that the old way—the way of greed and empire, of industrial mega-farming and pollution and privatization, of profligate waste and fossil-fuel consumption—is no longer serving us, and that it’s on us to make a change. You probably also have some sense of the preparations and solutions to which we are awakening as a people. The Emergency Preparedness paradigm hasn’t yet evolved to the point of true preparation, but has rather lingered in the inadequate realm of response. When disaster hits, we are only as prepared—only as resilient—as we have made ourselves through communication and conscious effort. As they say, preparation is best done in advance. > Ensia: How Three U.S. Mini-Farms Are Sowing The Seeds Of Global Food Security (Bob Cooper). Millions of small-scale farmers, especially in Latin America and Africa, are turning to biointensive farming because it’s low-cost and low-tech, and it produces far greater yields than conventional agriculture while using far less land and water. Research shows that biointensive farms use 50 to 75 percent less land, 50 to 100 percent less fertilizer, 67 to 88 percent less water and 94 to 99 percent less energy to produce a given amount of food than does conventional farming. Perhaps most intriguingly, biointensive methods “grow” farmable soil—at a rate 60 times faster than occurs in nature—while traditional farming methods tend to deplete farmable soil through wind and water erosion. > Yes! Magazine: Gig Economy (staff). Four out of 10 Americans work outside of the traditional 9-to-5, a rate that is growing fast. For workers, this “gig” work can feel both empowering and precarious. This issue looks at how we can bring out the best of the gig economy, but also protect workers. From cooperatives and online communities to “portable” work benefits, we can make the gig economy work for us. Martin do Nascimento’s article—When You Don’t Have A Traditional Job, This Is How You Get Creative —is a report on how several people in the Austin, Texas area are making a living by creating “gig jobs”. > Citizens Climate Lobby: LowCarbon Crossings for Climate Change (www.lowcarboncrossings.org). North Wind Regional coordinator Mindy Ahler of Edina, MN will be biking 4,000 miles over the next 11 weeks to inspire Americans to take action for climate solutions. Ahler will be joined by Ryan Hall of Detroit MI, who is completing his 3rd year as an AmeriCorps Volunteer with Green Iowa in Decorah, working on energy efficiency and river clean ups. The duo departs from Seaside, OR on Aug. 27 and rolls into Washington D.C. on Nov. 13, just before the CCE Congressional Education Days. They will conduct “Climate Conversations” with large and small groups, many of which will be organized by CCL Volunteers along the Adventure Cycling Route. They will also record people they meet through surveys and video, and share those stories with the appropriate congressional D.C. offices. Follow their journey at their website or on their Facebook page . > MN State Fair: EcoExperience.org, Aug. 25 – Sept. 5, 9:00am to 9:00pm daily; A huge exhibit at the Minnesota State Fair, filled with hands-on activities, demonstrations and resources. Don’t miss it!